On first glance, the Prologue to The Lord of the Rings seems like dry toast. Headings like "Concerning Pipe-weed" or "Of the Ordering of the Shire" do not seem calculated to inflame the passions. Even for those who enjoy Tolkien's donnish airs, the Prologue may appear to be little more than a recapitulation of the events in The Hobbit as a set up to The Fellowship of the Ring: hobbits love peace and quiet, the Shire's pretty sleepy, and Bilbo found a ring. Amid all the trivia about genealogy and hobbit architecture, the prologue reveals something essential: The Lord of the Rings is a book about books. Authors and readers -- rather than mighty heroes or seasoned adventurers -- are the main characters. In the Prologue, we are first introduced to Bilbo, Frodo, Sam, Merry and Pippin. But we meet them in the act of writing, collecting and reading books. Some of these books are the books that they will write when the War of the Ring is over: Merry's Herblore of the Shire or The Tale of the Years. Some were written during the War itself, like Bilbo's Translations from the Elvish. 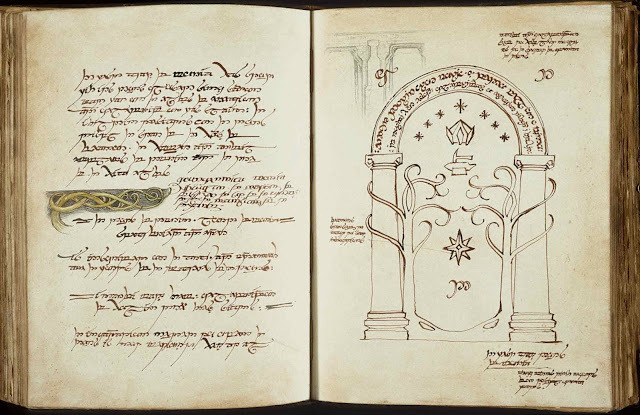 And one very important work was written years before by Bilbo - this is the first part of the book the hobbits call the Red Book of Westmarch... or what we call The Hobbit. The Red Book is important because it is the prototype for Frodo's own journey. As The Lord of the Rings progresses, Frodo will often end up comparing his adventures to the ones that he read about in The Hobbit. This seems natural enough perhaps, but it's good to take a step back and think about how weird this all is. A fictional character in a book writes the very book he's in. And then this real book goes on to be read by the main character in the book's sequel. This is a peculiar thing to write because nowhere in any version of The Hobbit did Bilbo lie to the dwarves and tell them that he obtained the Ring as a present. Instead, what Tolkien is doing is making fun of the fact that he -- the author -- changed The Hobbit from edition to edition. In the first edition, Gollum is a more friendly character and does intend to give the Ring as a present; at this stage, Tolkien had not conceived of the plot of the Lord of the Rings, and the magic ring was just a trinket. But in later editions of The Hobbit, to accommodate the growing mythology of Sauron, Tolkien changed Gollum into a fiend who could never give the Ring up willingly. So really, it is not Bilbo who was telling fibs, as much at it was Tolkien himself. Where does all this leave us? Well, as I read the Prologue, I am struck by the parallel between The Lord of the Rings and another great work of western literature. I speak of The Ingenious Gentleman Don Quixote of La Mancha (1605) by Miguel de Cervantes -- or, as it is better know, Don Quixote. Don Quixote is a novel about a country squire nearing the age of 50 (incidentally, when they embark on their journeys, both Bilbo and Frodo are country squires nearing the age of 50). The Don's wits are addled by reading adventure stories, and imagining that he's a great hero, he sets off on a series of haphazard adventures. To assist him on his journey, he takes along a plain-speaking farmer to act as his squire... this is Sam Gamgee Sancho Panza. More importantly, Don Quixote is also a book about books. As the Don travels, he keeps meeting people who have read earlier chapters of the book Don Quixote, and question him about his past doings in the very book that they are all now in. By doing this, Cervantes blurs the line between characters and readers. The effect is an endlessly self-referential work -- both funny and strange. The way that Cervantes plays with his readers is very much like how Tolkien plays with us in the Prologue. I don't know if Tolkien was actually influenced by Cervantes. But I do believe that the similarities between both books helps explain their enduring power. The Don, Frodo and Bilbo are people like you and I: readers of adventure stories, probably somewhat bookish, not too used to wielding a sword. And as these characters are overtaken by the world of adventure, Cervantes and Tolkien find ingenious ways to make the reader feel like he or she is entering the same world. Both authors use the books in their books to open a gate. To read on, here is my commentary on Chapter 1. Interesting points and a parallel that hadn't occurred to me before - probably about time I reread both these texts! I cannot but agree, I had never thought of that parallel before. Most interesting thoughts indeed. I'm glad to hear the connection doesn't sound crazy. Sir Walter Scott also writes similar 'framing narratives' in his novels. Scott, although sadly little-read now, was extremely popular at the end of the nineteenth century. It is possible that Tolkien read his work (although I have no evidence of this) and this may have been an influence. Another similarity is that Scott collected and studied medieval ballads. This led him to later edit and then write his own. This creative process reminds me of the way Tolkien studied languages as a philologist and then went on to create his own which in turn led to the writing of the history of these languages. In both cases the authors went on to create their own versions of that which they studied. This doesn't prove that Tolkien was influenced by Scott but it is an interesting point of comparison. I've been looking for an excuse to start reading some Walter Scott, and I think you just gave it to me. Old Mortality is one of my favourites. Highly recommended. I've not read the 3 or the hobbit in over 20 years. I haven't read Don Quiote but from what you've said about it I probably should. It would be great fun to recreate some of the skirmishes/battles in the fellowship, perhaps we could play a series between books using 3rd edition rules? Nice post. One thing that Tolkien does is emphasise the textual nature of the narrative, and that the narrator(s) are unreliable (we know Bilbo lies). He is emphasizsng that these are Hobbity histories, not 'real histories', as our Professor was intimate with the problem of the (multiple) authorship of Beowulf and of course the bias and rewriting inherent in the Anglosaxon Chronicle.